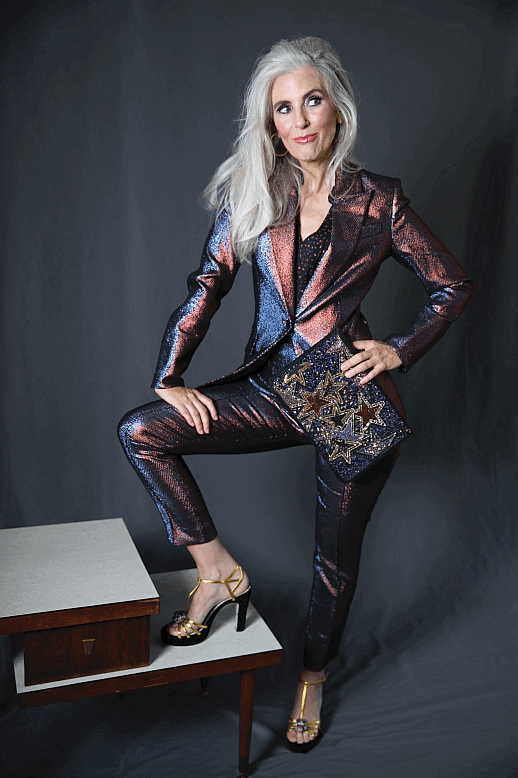 Fall Fashion heralds change and Memphis retailers are ready for it. There’s so much to be giddy about right now with modern influences, new shapes and silhouettes, and colors rarely seen this time of year. There’s also lots of pattern play, shades of black, and a super strong feminism that makes pulling off these new trends anything but shy. The new woman is just that–a woman. She is confident, radiant, aware and the styles that she engulfs herself in bring out the strength and beauty that truly comes from within. It’s an exciting time to be a gal right now with so much positive change in the air. Watch out world, the future is female and fashion is ready to play. Silver vegan leather jacket, cotton linen blend top with matching cropped pant, all from Kittie Kyle. Louis Vuitton repurposed lock and key necklace available at A. Shaw Style. Hoop earrings, model’s own. Life is not a dress rehearsal, so always put your best foot forward and make that impeccable first impression. Iridescent jacket and pants, top, platforms with tiger head, stars clutch; all from Joseph in Laurelwood. Hoops, model’s own. Boys don’t make passes at girls who wear glasses…. but women don’t care either way. Eyewear has really become stylish and rightfully so. This accessory can parlay your personality and is even complementary with a fantastic, vegan leather blazer and sequined tuxedo pants. It even stands firm with a knock out necklace. 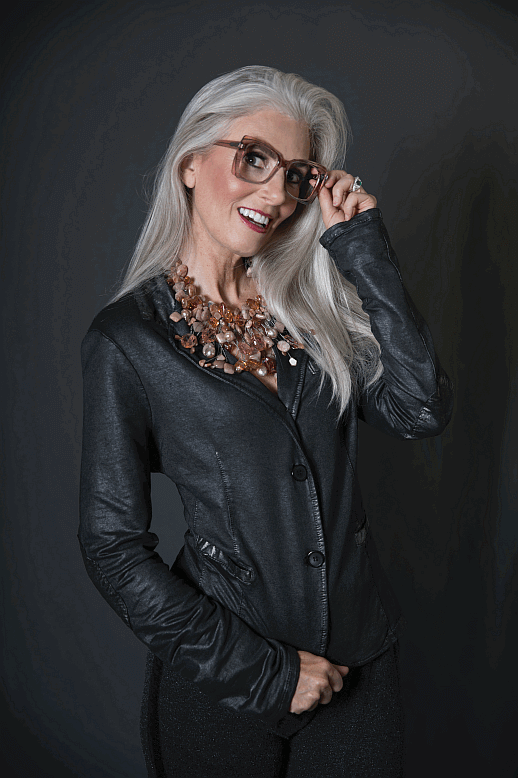 Eye glasses from SEE Eyewear in The Shops of Saddle Creek. Blazer and pants from Betty Hays Boutique. Necklace by Allie Rox and ring, both from Hollie Winter Fine Jewelry. The jacket also makes an appearance in cocktail situations. Here, there is structure without being severe. Femininity is quietly strong and elegant. Cocktail jacket and tank from Coming Attractions. Diamond earrings from Hollie Winter Fine Jewelry. Repurposed Chanel necklace from A. Shaw Style. The fitted jacket is pushing through lots of seasons of flowy trends. Today’s blazer is very tailored and is the best way to add an instant update to any wardrobe. Don’t be afraid to pair plaids with florals-this is the modern mix. 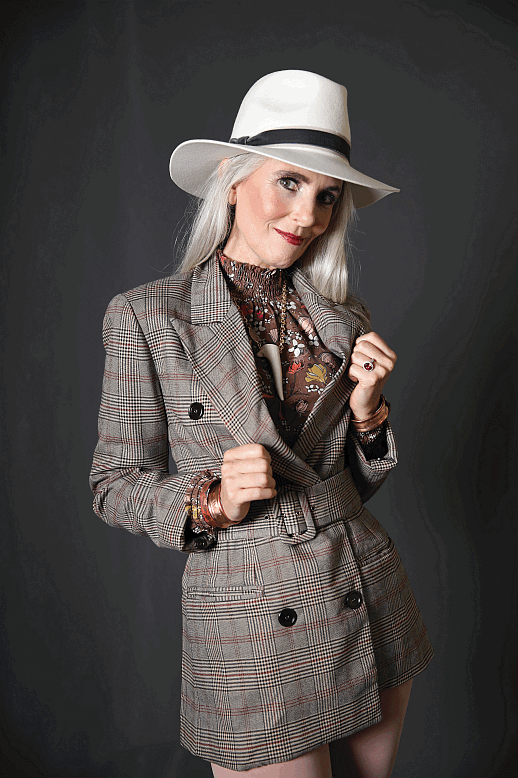 Plaid trench jacket, floral blouse, rose-colored denim, and copper cuffs; all from Southern Muse. Necklace by Brave Design and hat; both from Oak Hall. Ring from Hollie Winter Fine Jewelry. Instead of wearing all black, try lightening it up with fresh colors straight from the Fall forecast. Here, black is paired with aubergine and pewter for a look that’s eye-opening and confident. Wrap top from Sorelle Boutique. Stretch leather pants from Oak Hall. Pearl and metal necklaces (two) layered together by Allie Rox from Hollie Winter Fine Jewelry. Pewter boots from Joseph in Laurelwood. Vintage aubergine leather gloves, stylist’s own. Yes, for real. It’s time. The faux varieties look and feel really good and are cruel-free. Faux shearling vest from Southern Muse. Mustard knit maxi dress and metal mesh bandana worn around neck, both from Oak Hall. Eyeglasses from SEE Eyewear in The Shops of Saddle Creek. Vintage clip earrings stylist’s own. Pewter metallic boots from Joseph in Laurelwood. Fashion Tip: metallics are actually neutral when it comes to this Fall color palette. A great investment in boots this season should be in your favorite heavy metal color. Mixing prints can be tricky. Make sure to complement colors and balance scale for guaranteed success. Patterned blazer, pleated wool skirt, and scarf tied as a blouse; all from Kittie Kyle. Vintage clip earrings, stylist’s own. Ring from Hollie Winter Fine Jewelry. Fashion Tip: believe it or not, sheer hose are coming back and lightens things up in a very balanced way. The decade that gave us Madonna and Miami Vice pops up again with its signature patterns and colors. Windowpane plaid pants, turquoise ribbon tie top; both from Lori James. Metallic ball earrings from Kittie Kyle. Metallic boots from Joseph in Laurelwood.